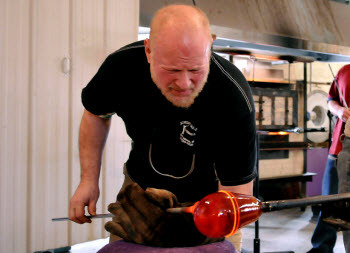 Jay Bavers' Russian grandfather first taught the East Jordan glassblower the details of the craft. At Jordan Valley Glassworks, glassblowing remains a family affair, as Bavers and co-owner Glenna Haney rely on assistance from Bavers' wife, daughter, son and grandson. Jordan Valley has been going for 14 years and, despite a recent dip due to the effects of the Great Recession, Bavers and Haney are optimistic for the future. "We just want to continue what we’re doing. We don’t want to get bigger,” Bavers says. Bridge contributor John Russell spent some time at Jordan Valley to detail how heat, sand, lung power and skill are turned into art.